Japanese ladies who love their vampires and pretty boys will soon be able to get a much-needed fix. Prototype has announced that they are publishing Karin Chatnoir Ω’s boys-love visual novel Omega Vampire for the Nintendo Switch in Spring 2019. The interactive story originally launched for PC in late 2016. Check out the game’s synopsis, courtesy of VNDB. A world in which humans and vampires share a bare minimum coexistence. The year is 20XX in Yokohama. The Aoi Research Firm has shone light onto the medical world, developing an artificial source of blood called EX-BLOOD, putting an end to the shortage of blood. At the same time, the vampires who had hidden themselves in the shadows emerge and declare that they will now coexist with humanity. They gradually began show themselves out in society. But by nature, vampires prefer human blood. Some of them continued to assault humans. Even as those vampires that wish for a peaceful coexistence with humans try to keep the others in check, “vampire hunts” are also widespread, carried out by some humans due to a drug-like high a human experiences when drinking a vampire’s blood. 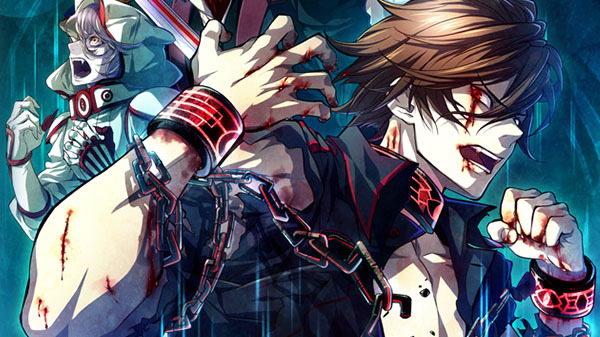 The protagonist, Moriya Keiichi, sustains life-threatening injuries in an accident. His best friend, Aoi Setsuna, saves his life with a brand new drug which utilizes a vampire’s extraordinary healing capabilities. As a side effect, Keiichi’s attribute ends up transforming from Beta into Omega. Keiichi’s newly Omega pheromones attract the vampires to him. One day, Keiichi finds himself saved from a dire attack by an Alpha vampire, Ooizumi Genma.